Kenny Solomon has suddenly become one of the biggest stars on the African chess scene. After securing the IM title at the recent All-Africa Games, he becomes the latest to earn the title and in addition, will represent the region in the FIDE World Championship Knockout tournament. He will join the elite group of players to have won this honor. What is impressive about Kenny is his will and determination at the board. He routinely plays out positions until the last pawn and eschews short draws. After his U.S. tour culminating with the Wilbert Paige Memorial tournament, other players were impressed with Kenny's determination and fighting spirit. The year 2003 has been magical for the South African native as he also won the South African Closed. A self-described "semi-positional, semi-tactical" player, Kenny's ultimate goal is to become a Grandmaster and to be the best that he can be! Meet Africa's newest International Master! Growing up in the house with five brothers and two sisters would certainly give one the fighting spirit to tackle the world head-on. Young Kenny led a normal child that involved getting in his share of trouble, playing marbles and carousing with his friends. In 1990, the Solomon family moved from Lentegeur to Montclair which is located in the Cape Town Province. 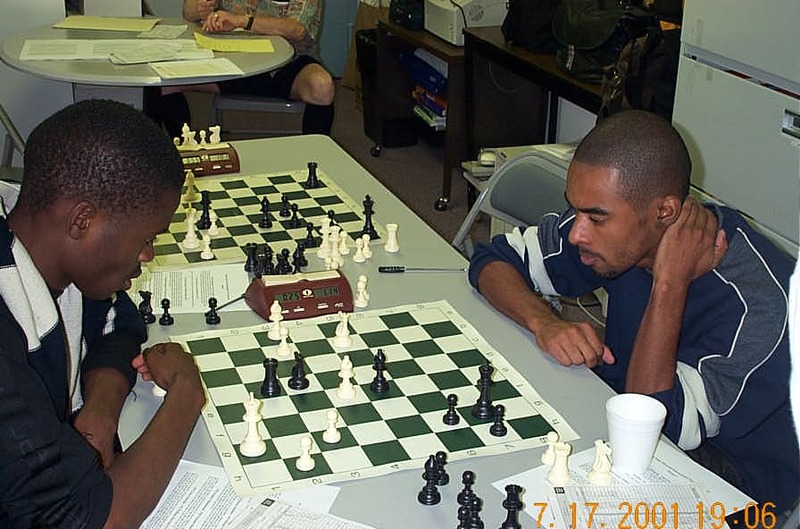 As a rite of passage, Kenny was taught chess at the relatively late age of 13 by his older brothers. Prior to that, young Kenny was usually out playing and carousing with his friends. His elder brother Maxwell Solomon (National Master) had perhaps the biggest influence, but Kenny does not hesitate to mention that both Graham and Aubrey were excellent sparring partners! An article run after Kenny won the South Africa Closed quote him as saying, "Chess has become a passion. It helps build logic and creativity, and I enjoy the psychological aspect of it as well." Along with IM Watu Kobese (who defeated Solomon at the All-African Games), he represents the heart and soul of South African chess as both will have represented the nation on the world stage. "My goals are plain and simple… to become a GM and then take it from there." King Solomon on the Rise! With limited opportunities for professional players in the African region, Kenny is fortunate enough to have participated in several international tournaments including two in the U.S. He has competed in the last three Olympiads (Elista 1998, Istanbul 2000, Bled 2002) and states that from these tournaments alone, he has gained more than 100 ELO points. At the 2000 Olympiad he missed the IM title by ½-point… he was unaware that he needed a win in the last round and settled for a draw. His final score was a solid 7½-5½ on board #2. In the 2002 Olympiad, Kenny scored 50%, but scored three wins in last four rounds. 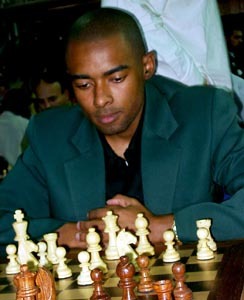 Kenny was invited to participate in the historic Wilbert Paige Memorial tournament in the summer of 2001 and also played in the U.S. World Open scoring an impressive 6-3. The Wilbert Paige tournament was a test as it was the first chance that the world got to see Kenny's tenacity as a player. While missing an IM norm by a point, he impressed all with his stamina and determination. During the tournament, his games had the following number of moves: 81 (½), 76 (1), 47 (0), 40 (1), 37 (0), 91 (½), 50 (½), 66 (1), 69 (½)… 62-move average! Most recently Kenny's star began to rise when he was triumphant at the South African Closed tournament, edging rival Kobese on tiebreaks. After this win, an article was written about his accomplishments titled, "First Chess Grandmaster from Cape Flats?" The article provided readers with a good idea of what makes the 23-year old tick. Lyndon Bouah, President of Chess South Africa (CHESSA) said Africa had only three grandmasters, two in Tunisia (Slim Bouaziz and Slim Belkhodja) and one in Morocco (Hichiem Hamdouchi… Africa's top player), with none in the Sub-Saharan region. "Players like Kobese and Zambia's Amon Simutowe have managed to score one norm, but with Kenny winning last weekend's Closed Championship undefeated, he has signaled that he has arrived and has the potential." Amon Simutowe and Kenny Solomon conducting post-mortem of their encounter in the 2001 Wilbert Paige Memorial. Solomon won for the first time against the Zambian. Actually 21-year old Simutowe has two GM norms, but Solomon is trying to catch the Zambezi Shark who has a ridiculous plus-score against African competition. The two met in the recent African Team Championship with Simutowe coming out victoriously. However, in the Individual Championships, Kenny mustered up every bit of strength to win a thrilling last-round encounter over IM Imed Abdelnabbi to earn the IM title! Kenny mentions the impression that other African players have on him. Players like Hamdouchi "has proved that he can hold his own against the elite Grandmasters and also has a plus-score against Bologan!" These accomplishments are important for the confidence of African players and those of African ancestry and Kenny realizes that there will be many watching his performance. With a bright future ahead, Kenny will certainly make an impression and will no doubt cause surprise when he refuse draws to very strong players. However, this is what makes him the fighter he is… a Solomon fighter… a King Solomon! Interview composed from e-mail exchanges: November 2003.